Posted by Jessica Lee on 03/16/2011 @ 8:36 am | Comments Off on Reaching Latinos and U.S. Hispanics Online: An Interview with Yahoo! The SES New York conference is right around the corner and this year, the conference has a special focus on Internet marketing and online business for the Latino and U.S. Hispanic markets. I was able to grab a few minutes of time with the general manager of Yahoo! Hispanic Americas and SES speaker, Armando Rodriguez. 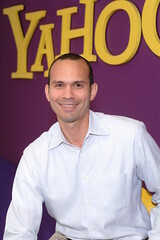 Armando oversees Yahoo!’s sales strategy and business partnerships in the U.S. Hispanic market, Mexico, Argentina, Peru, Chile, Colombia and Venezuela. He’s also responsible for the management of all revenue streams, including display and search advertising, and the expansion into new markets in Latin America. Jessica: What do the growth opportunities look like for the Latin America and U.S. Hispanic sectors? Armando: Yahoo! reaches one out of every two Internet users in Latin America. In the U.S. market, more than 80 percent of Hispanics online use Yahoo!’s products and services. Latin America is one of the fastest growing Internet markets in the world, and the Latin American and U.S. Hispanic audiences are a very important part of our online strategy and growth. The more we provide deeply meaningful and personal content and services tailored to the individual’s needs and interests, the more we can grow our audience and increase revenue. What countries or regions in Latin America seem to be embracing online business the most, and why do you think that is? Consider this: Brazil is already the fifth largest country in global Internet usage, but today less than 30 percent of Brazilians are online. In next few years, Internet penetration is expected to double, catapulting the country into the top three in worldwide Internet use. Mexico is currently ranked as the No. 14 country for Internet use with only 30 percent of the population online; Argentina is the most penetrated Latin American country, ranking No. 19 globally with 60 percent of the population online. The story of growth is similar in other Central and South American countries. With an increase in online audience, marketers and advertisers are spending more on digital campaigns. They want to be where their audience is, and connect with consumers in more personal and tailored ways than mass broadcast or outdoor advertising offer. What are the unique challenges of expanding to or working within the Latin America and U.S. Hispanic markets? Each country is different, with unique needs, tastes and media consumption habits – a one-size-fits-all approach will not work. U.S. Latinos tend to consume, communicate and engage more online than the average U.S. user. They tend to be more loyal to Internet brands and visit the same sites and services that their friends/family recommend and use. The larger American audience tends to be more scattered in their online preferences. Another main difference is that most Latinos live in two worlds consuming content in both English and Spanish. How is Yahoo! investing to reach these audiences? For the U.S. Hispanic market, we’re drawing deeper synergies between our Yahoo.com and Yahoo! en Español properties, making it easier for a bilingual audience to discover content and services. We’re also developing more compelling, original content and an editorial voice geared towards the evolving Hispanic audience. Across Latin America, we’re focused on growth and being at the forefront of consumers’ Internet usage by harnessing our global platforms to deliver local content and experiences (or instead of experiences “services”). We’re also launching new products and ad solutions, and continuing to invest in our Latin American success. What are the consumer trends within the Latin America and U.S. Hispanic markets? Latin Americans and U.S. Hispanics online habits are quickly becoming more sophisticated, as the Internet becomes an even more integral part of their consumer behavior. They are connecting to the Internet at a faster rate than the rest of the world, they are leading the way in their usage of social media, video content, mobile devices and over-index on time spent online. How can marketers and advertisers reach these audiences? There’s no arguing that digital is now an essential marketing channel to reach the Latino consumer. Yahoo! provides advertisers with unparalleled opportunities to reach a highly engaged audience at the right time, with the right message. Yahoo! combines the science and art of getting the right message to the right consumers in quality context – all with a tremendous digital scale. We offer advertisers precise targeting, deep consumer insights, and tools that leverage those insights in real time for optimized program performance. Creativity is another key element – we’re helping advertisers be as creative online as they are offline, developing lasting emotional engagement with our consumers. As a premier digital media company, we’re creating more originally produced entertainment, providing marketers with high quality content that they want to be associated with. For instance, De Moda is a Spanish-language program devoted to women’s fashion and interests, and is sponsored by P&G; La Locura is a new weekly program with offbeat sporting highlights sponsored by Toyota. We just named the finalists for Bello 51 – the fourth year in a row we’ve partnered with People en Español to find the 51st most beautiful person to grace the magazine and pages of Yahoo!. Bello 51 is sponsored by Maybelline New York, Garnier and Orbit Gum. These are just some of the creative ways we’re creating opportunities for marketers to engage with their audience. We’re also pioneering new ad formats on PC, mobile, Connected TV and tablets, as well as and branded video content options that deliver results and positivity impact marketers’ businesses. Armando will speak on the Analytics for Latino Markets panel on March 22 at 2:30 p.m. at SES New York; Susan Esparza is scheduled to liveblog this session. Stay tuned for coverage. Microsoft + Yahoo: What’s It All Mean?